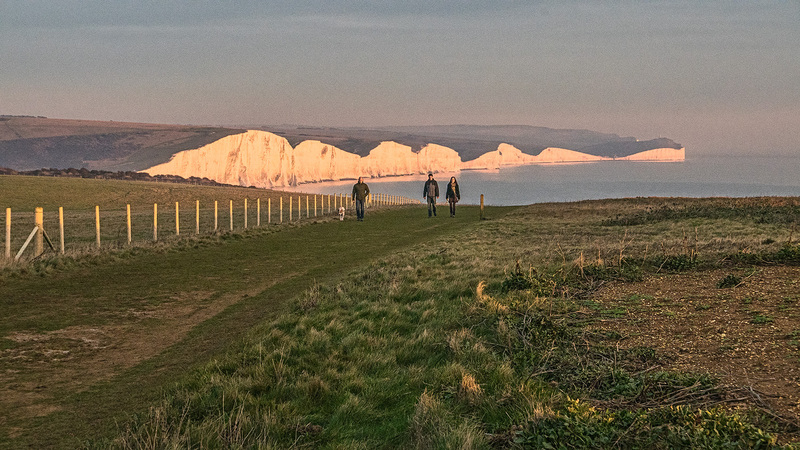 A couple of days after Christmas I re-visited this classic view of the Seven Sisters cliffs with my son. This must be the third or fourth year in a row that we have used a fine day just after Christmas day to have a good walk together. This view has been photographed, painted, and published as a Postcard, Poster or Illustration countless times and still it grabs my attention. 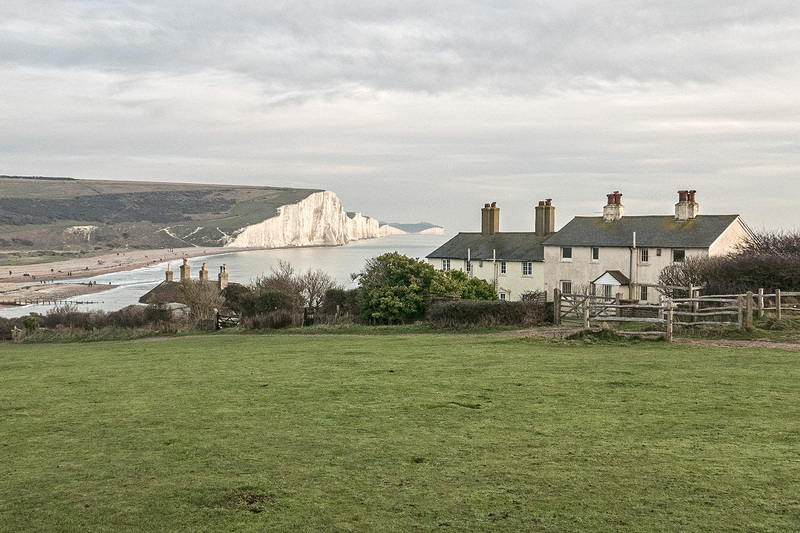 In the foreground are the old Coastguard cottages, the beach (extreme left) is Cuckmere Haven, and from there the Seven Sisters stretch into the distance. The furthest dip in the line of the cliffs is Birling Gap. This headline image doesn’t scream ‘nice day’. It’s all a bit grey, but for once we got the weather spot-on. As usual we were late setting off for the one-hour drive to the parking area on Seaford Head, where we munched our way through sandwiches. By then it was already 2.30pm with about an hour and a half of daylight left. But what a glorious ninety minutes of light we had ahead of us. The sun made an appearance, and the views out to sea were superb. The soft light of a wintry sun really does result in some glorious images. 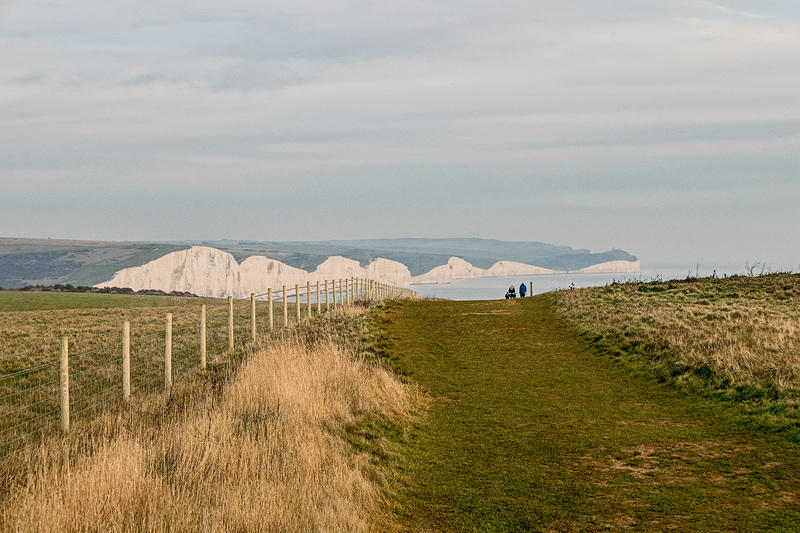 We walked along the cliffs away from Seven Sisters towards the town of Seaford – a walk I’ve never done before. The compressed view of the cliffs from the classic site doesn’t really give a good impression of the length of this particular piece of coastline; but as we walked the views back to the cliffs really opened out and we started to get a far better impression. The sky was magnificent too. The light started to change all too soon and as we turned round just on the edge of the drop into Seaford, the light warmed up and what I would call an Alpine Glow slowly turned the white cliffs to gold. The Alpine Glow, as it’s known, is a familiar sight in the Alps when the snow-capped peaks are lit up by the setting sun, but I’ve never experienced that effect on an English landscape quite as good as this. This was a special day. January is not a month renowned for special days, and since then the sun has been conspicuous by its absence. The days have been dull and grey. It’s the season when we want to hibernate. I took a two week break from WordPress which seems to have stretched into a whole month. Once you stop blogging, it isn’t easy to get started again! I’ve not achieved a great deal this month apart from printing a lot of B&W images and preparing entries into club competitions and for a forthcoming club exhibition. This entry was posted in Coast and tagged Alpine Glow, Birling Gap, Cuckmere Haven, Photography, Seaford, Seaford Head, Seven Sisters. Bookmark the permalink. What a marvellous walk, and the Alpine Glow looks stunning, Andy! Thanks Sue. It is a great walk. An out-and-back walk from the car park to the cliff edge is level and makes a lovely short version of the walk. Thanks, Andy….will have to take a look if I’m down that way! It’w well worth it, Sue. Not an easy car park to find. The post code of it is BN25 4JQ. If you’ve got Google Maps on an iPhone or a satellite navigation gizmo then enter that code and you will save a lot of staring at a map trying to navigate there! And a warning – you come to the end of a road and think you must have taken a wrong turn, but you then turn right up a single track concrete road up to the car park on top of Seaford Head. Oh, OK, thanks for this detail! I hate these tricky places ! The golden glow on the cliffs is wonderful – how lovely that you were there on a day with a bit of Winter sunshine. That sky: wow! Thanks Meanderer. Yes, we were very lucky. The sky was very special. I wish we had a few more days like that! This is a stunning reentry into your blog, Andy. Welcome back. The alpine glow is wonderful, and so is the gaze across water and sky, your second photo. It’s nice to revisit a place you’ve shown us before, Andy. 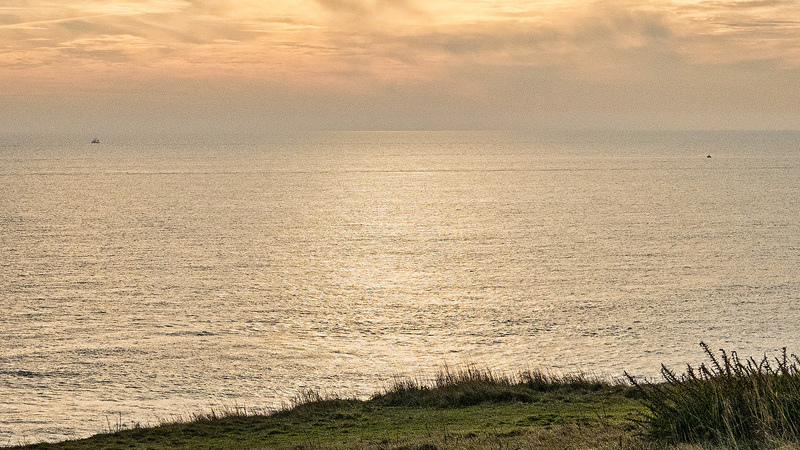 I like the sense of familiarity when I hear of Birling Gap, or see the Coast Guard cottages. I’m especially fond of the sky and ocean photos, but the alpine glow is delicious, too. I’m glad you had such a day, particularly if things have gone gloomy again! Thanks Linda. The alpine glow was a real bonus. Usually when I am out with my son at that time of year we end up hurrying to get back to the car before the light completely disappears! Same again this year, but we were richly rewarded! Thank you for sharing this lovely walk with us, Andy! 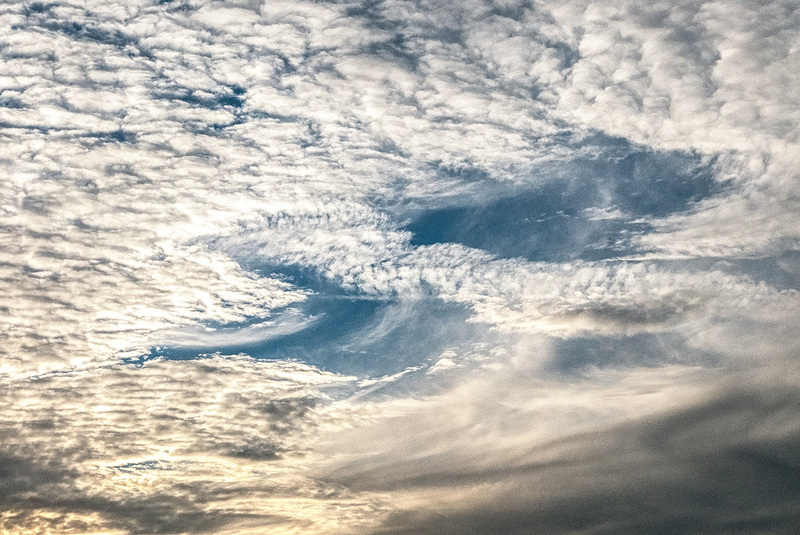 I love your photos individually, but especially love how — in aggregate — they tell us a story about the light that day. The last two images are especially magnificent! Thanks very much Heide. I’ve found that the coast is a wonderful place to be atmospherically. It’s one of the things that I enjoy most having moved from somewhere where we were about as far from the sea as we could be in England. Now it’s forty to fifty minutes. And the combination of Sky and Sea can be extraordinary. I now understand why JMW Turner had such a love for the south coast. Looks like a grand day to me, Andy. Some lovely tones in these images. Nicely done! Many thanks Earl. A nice winter’s day, cold but no wind and beautiful light. I’m happy to hear you’ve gotten a lot done in your “time off” and wow, yes, that was a special day! We have a mountain in the distance here that glows in the setting sun – when there IS some sun – and there’s nothing quite like it. But seven cliffs, that is spectacular. I can sympathize with getting a late start on those jaunts and eating sandwiches in the car….and we know we’re lucky, don’t we, to have lives where we can do things like this. A very nice post, Andy. Thanks Lynn. Have you noticed how everything you aim to do always takes twice as long as you expected. It’s like that when Son and I plan a walk. We are always late setting off, for a variety of reasons. But we are used to just taking the day as it comes and sometimes – as on this day – we do really strike gold! The greatest joy of retirement is doing what you like when you like – it’s a special form of Freedom! It’s always a treat to see the Seven Sisters. Happy to see the two of you had such a lovely day together, your photos glow! Thanks Dina – it certainly was a great afternoon.